Mull has live music, bands and a swimming pool. The population is 2700. The pool provides a refreshing swim and exists as a monument to the fundraising skills of the locals. Every April the island has a music festival and bands perform at its pubs and hotels. There is a police station on the island. Its one telephone number is often on divert to Oban on the mainland, so managing a music festival in Mull must take as much effort as building a swimming pool. Telephone maintenance provokes bitterness in Mull. It took money hungry BT Telecommunications nineteen days to repair the line that was used by the local GP. If life continues, the population changes. Although there are more expensive properties, pleasant detached houses can be bought on Mull for less than £200,000. 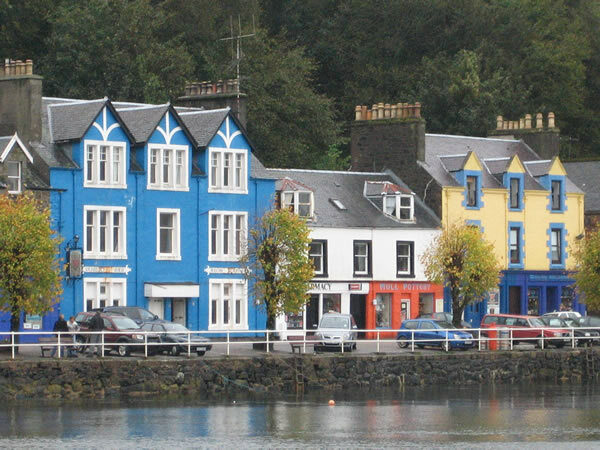 The financial logic for commercial properties is odd, so at the moment a 28 bedroom hotel in the island capital, Tobermory, is available for £700,000. Those in the UK or on the European mainland who have nest eggs or run independent on-line businesses are attracted to Mull. Some of the immigrants have been affluent and half-hearted hippies. The more bitter locals have mentioned ethnic cleansing. This is an exaggeration but Mull is now both traditional and, compared to previous social and economic rigour, multi-cultural. The tourist industry describes Mull as a walkers’ paradise. Dedicated walkers with any sense, though, will choose other Scottish locations. Glorious landscape can be seen on Mull but tramping it is another matter. The mountain Ben More is the exception. It can be climbed from Dhiseig without hindrance or trouble. Other islands can be seen from the peak, and the rocky narrow ridges provide pleasure for the confident and ambitious. The 40 minute ferry from Oban visits Mull every two hours. The Lochaline ferry is cheaper and avoids busy Oban. Driving around Mull on mainly single track roads is a pleasure, and the beaches are empty and glorious albeit often damp, windy and chilly. Birds of prey, including white eagles, can be seen flying around the cliffs. Because it has a coastline and lochs, Mull has seawater and freshwater fishing. Tired fishermen can visit the pubs of Tobermory. The beer is great. Food ranges from the decent to the pretentious. Ferries also connect Mull to the islands of Iona and Ulva. Iona has been described as the cradle of Scottish Christianity. In 563 AD, Columba travelled the short distance between Ireland and Scotland. Much later Frankenstein did the reverse journey. With twelve companions Columba established an influential monastery. Iona is three miles across and the island can be investigated on foot in a day without much effort. Samuel Johnson said, ‘The man is little to be envied … whose piety would not grow warmer amid the ruins of Iona.’ No one should argue with the ambition of the Iona Community, ‘peace, social justice, rebuilding of community and religious worship’. Their website is slick and impressive. The island Ulva is owned by the Howard family. The population was once 600 but is now sixteen. An island owned by just one family may deter some but at least access is not denied, and calm and balance are maintained. Visitors soon forget modernity and the trivia of civilisation. Posted in Ben More, BT Telecommunications, Columba, Dhiseig, Frankenstein, Howard family, Iona, Iona Community, Lochaline, Mull, Oban, Oban Police, Samuel Johnston, Scottish Christianity, Tobermory and tagged Britain, Culture, travel, UK history on August 1, 2015 by Howard Jackson.